Is the rubber match between Clemson and Alabama the best matchup? This year, there are 39 FBS bowl games before the CFP national championship. We know all the teams and we know all the matchups. As always, bowl season will provide some amazing games, along with some unfortunate clunkers. Here are all 39 games, ranked from the worst matchup to the very best. I am not a fan of this game. At all. Florida State rescheduled ULM to keep its bowl streak alive, and will be gifted an easy win as its reward. Southern Miss couldn’t do anything against Tennessee; what’s going to happen against Florida State? Arkansas State is one of the better Group of 5 teams out there, and was seconds away from defeating Troy this past weekend. Getting stuck playing MTSU should be a big disappointment and an easy win for the Red Wolves. Both of these teams are decent, but this is a huge step down for Western Kentucky from where it was under Jeff Brohm. This should be a pretty even game, though, so hopefully it’s enjoyable. Colorado State started out the season strong, and actually moved the ball pretty well against Alabama. This season has been the reverse of last year, though, as the Rams limped to the finish. Marshall very quietly won seven games. This matchup really can go any way, but there’s nothing much compelling about it. Fresno State deserved a better bowl opponent than this. Houston impressed in its games against USF and Memphis, but laid absolute eggs against Tulsa and Tulane. Fresno State won nine games and constantly improved through the season. We could have seen them play a decent Power 5 team or a top Group of 5 team. Instead, the Bulldogs face inconsistent and probably overmatched Houston. The Chippewas didn’t fall off too much this year without Cooper Rush. Wyoming, meanwhile, did not quite live up to expectations this year. The Cowboys were expected to be one of the top Group of 5 teams, but Josh Allen just doesn’t have so much talent around him. Still, these two teams should be evenly matched, so we might see a good game on the blue turf. SMU started out this season strong under Chad Morris, but didn’t finish well. This should be an exciting offensive matchup with Louisiana Tech, who took a step back from their usual standard this season. This will probably be one of the least watchable bowl games. Neither team is particularly good, though both did barely manage to get to six wins. So why is this game not lower on the list? It’s New Mexico State’s first bowl game since 1960 (ironically enough, also against Utah State), which means it’s worth peeking in on. Akron has undergone an incredible turnaround under Terry Bowden, and the reward for reaching the MAC Championship Game this year is a bowl matchup against a much-better FAU team. The Lane Train will roll, but Akron might be able to make a bit of a game of it. Temple very quietly won six games this year, a huge step back from their excellence under Matt Rhule. Still, this Temple team has a lot of talent and can definitely keep up with eight-win FIU. This should give us a good game, and don’t let the disparity in records fool you. Maybe this game should be a little higher, but I’ve been a bit down on NIU all year. Still, this is a classic matchup of a good Group of 5 team against a mediocre Power 5 team. Those can always make for fun games, and the potential upsets are big for the schools and conferences. Navy took a step back this year, though the Midshipmen are a solid cause. Virginia, meanwhile, looked much improved in Bronco Mendenhall’s second year. This could be a decent game, and Navy is always worth watching, but there’s nothing superlative here. This is a surprisingly decent matchup. North Texas won nine games this year, and Troy won 10, including a win over LSU. Both teams have strong offenses, though Troy’s defense gives the Trojans a huge advantage in the game. It might not be a high-profile matchup, but this should be an entertaining way to kick off bowl season. This game doesn’t have much going for it. Texas is back in a bowl after a short hiatus (though, at 6-6, it’s not an impressive performance), though Missouri is one of the best turnarounds in all of college football this year. This game is decidedly mediocre. It’s not a bad matchup, though West Virginia should be favored, but there’s nothing compelling about it either. It’s two middle-of-the-road Power 5 teams facing off on a Tuesday afternoon. Another mediocre game between middle-of-the-road Power 5 teams, this one at least has some intrigue. Iowa kept Ohio State out of the College Football Playoff, after all, and Boston College had a very underrated successful season. This should be a good, old-fashioned, smash-mouth game in Yankee Stadium. UAB is one of the underrated stories in college football this year. This program was literally revived from the dead, and the Blazers won eight games and are going bowling. Their reward is a good matchup against a talented Ohio team that struggled to end the season well. Army won eight games this year, and gets rewarded by facing the most under-appreciated 10-win team in the country. San Diego State, led by 2,000-yard rusher Rashaad Penny, won 10 games with almost no fanfare. This should be a solid game, especially if the Army defense can slow down the run game just a little bit. One crazy fumble changed N.C. State’s bowl outlook from the Citrus or Camping World bowl to the Sun Bowl. Arizona State played one real great game this season, in the win over Washington, but really didn’t do anything else noteworthy on the year. The last time these two teams met, Boise State completely shut down Chip Kelly’s team and LeGarrette Blount threw a post-game punch. Boise State very quietly has 10 wins on the year. The same thing happened last year and the Broncos laid a total egg in the bowl game, so Brian Harsin will want his team to show up big in this one. Neither of these Power 5 teams are particularly compelling, but this should provide a solid matchup. Also, every Kansas State bowl game is potentially Bill Snyder’s last game, so it’s always worth tuning into. This could also be Josh Rosen’s final college game, which you wouldn’t want to miss either. Northwestern, very quietly, has won seven straight games — the second-longest winning streak of any Power 5 team. The Wildcats have not fared well against the SEC in bowl games recently, but they are balanced and face a Kentucky team that has struggled at many points in the season. This should be a really good game. Neither team had a great season, but both are solid and should play a tight game. The Cowboys have a tremendous offense while Virginia Tech is more balanced, though the Hokies are anchored by a good defense. This should be the game where the two-week-long “bowl week” pivots from good non-Power 5 matchups to matchups between top teams. This is a very underrated matchup. Texas A&M will be transitioning to a new coach, and Wake Forest has slid under the radar all season. This matchup should make for a very good game, even if it doesn’t get much talk leading up to it. This matchup should be great for two reasons. First of all, it’s always fun to watch when top Group of 5 teams face off against above-average Power 5 teams. Second of all, this is a great clash of strengths. Iowa State has a very tough defense, but the Cyclones will have their hands full with the high-powered Memphis offense led by quarterback Riley Ferguson. Also, this game will feature two of the hottest coaching commodities in the country. Matt Campbell and Mike Norvell will have big-time offers soon, so they’re worth checking out here. I love this game. Every year, the battles between the top MAC and Sun Belt teams provide great football, and this should be no different. The Mountaineers looked strong in Sun Belt play, and the non-conference losses to Georgia and Wake Forest look pretty impressive in retrospect. Toledo is probably more talented, but these two teams are close enough to equal that we should get a great game out of it. Mississippi State will be without quarterback Nick Fitzgerald, which takes a lot of luster off this game. Still, make sure to watch Louisville here. This will probably be your last chance to watch Lamar Jackson in college, so make sure not to miss it. He’s against a good defense, which will either lead to a colossal disappointment or make for going out with a huge bang. Either way, this game is worth watching. This might not be the highest-quality football game, but it will be can’t-miss television. Both teams struggle on defense, but have explosive offenses. This will be our last chance to see Quinton Flowers in college. He had some preseason Heisman hype, but kind of fell off the radar this season. Expect a high-scoring shootout in one of the more entertaining bowl matchups. This is one of the higher-ranked matchups of bowl season, but it’s not the most compelling. TCU has struggled against the good teams it has faced this year, and couldn’t do anything against Oklahoma either time the two faced off this year. This game has potential, but there’s a good chance that it’s just a Stanford rout. This is a revenge match from a great bowl game three years ago, when Notre Dame knocked off LSU and ended the SEC West’s undefeated season against outside competition. This is a game between two very good teams, but it feels like Notre Dame will come into it very disappointed, as the Irish were in Playoff position a few short weeks ago. LSU has kind of skated under the radar this season, with a loss to Troy and a win over Auburn (both before November) not mentioned much over the season’s home stretch. On the surface, this may seem like another mediocre Power 5 bowl game. That first glance couldn’t be more wrong. Jeff Brohm has done incredible things at Purdue in just one season, and his reward is to take on Arizona. Khalil Tate is the best dual-threat quarterback that college football has seen in a long while, and don’t miss any chance to see him. I’m pretty sure that this is the first NY6 bowl in the Playoff era where the two teams combine to enter on a three-game losing streak. Miami did not end the season well at all, to say the least, and will now have to face Wisconsin’s stiff defense. Wisconsin’s offense has issues, though, and that plays right into turnover-happy Miami’s wheelhouse. Still, these are two very good teams, and the winner of this game will finish the season in the Top 10. It’s hard to get as excited for this game as for some of the other NY6 bowls. UCF’s undefeated season deserved a shot at a top team, and three-loss Auburn just doesn’t have the feel of one, especially after how the Tigers lost to Georgia. Still, UCF’s high-powered offense will have a battle against Auburn’s staunch defense. Keep an eye on UCF sophomore quarterback McKenzie Milton, who looks to be following in the path that Blake Bortles set at UCF four years ago. This should be a tremendous clash of styles. Michigan State is an old-fashioned, smash-mouth, run-first football team with a salty defense, while Washington State is a pure air raid offense that was backed up this season by a solid defense. Watching these two operate against each other should be every Xs and Os guy’s dream. Also, Mike Leach is always just fun, so don’t miss it. Last year, Penn State provided one of the best Rose Bowls we’ve ever seen, and certainly since Vince Young beat USC in the final minute. This year, Trace McSorley and Saquon Barkley will face another Pac 12 team. Washington struggled late in the season, but the Huskies have one of the best defenses in the country and should be up to the challenge of keeping Penn State in check. This will almost certainly be the most-hyped bowl game of the season, but it really shouldn’t be. It’s Clemson vs Alabama Part 3, but Clemson just looks so much better than everyone else right now. Alabama struggled, greatly, in its last three games against good teams, and Clemson is a great team this year. This game may as well be the Rose Bowl, except it’s not in Pasadena. This matchup is between two of the most talented teams in the country, both of whom suffered one bad blowout loss to mar otherwise excellent seasons. This will be J.T. Barrett’s final game in a Buckeyes jersey, and possibly Sam Darnold’s final game at USC as well. Last year, USC gave us the best game of bowl season (okay, second-best, behind the NCG) against a Big Ten team. Expect a repeat of that this year. The “Granddaddy of them all” is also the granddaddy of this year’s bowl season. Oklahoma has the best offense in the country, and the defense has been steadily improving as the year has gone on. 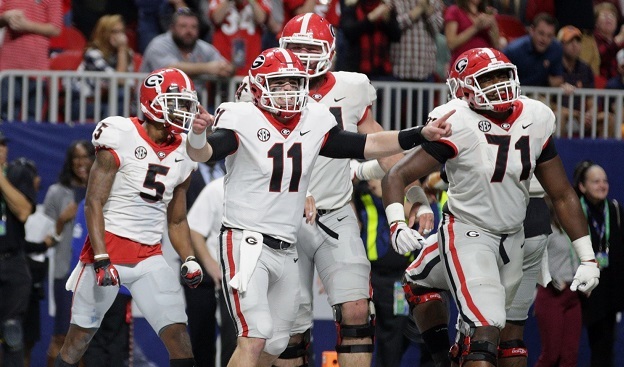 Georgia, led by true freshman quarterback Jake Fromm, has been an inexorable force on offense, while the defense has been steadfast all year long. This game should be an incredible clash of styles, not to mention the fact that both have new head coaches (Georgia’s Kirby Smart is in his second year, while Oklahoma’s Lincoln Riley is in his first). Expect this game to be can’t-miss football, so make sure you don’t miss it.